Grape is one of the oldest fruits being grown by man. However, it was introduced into north India from Iran and Afghanistan in 1300 AD by the Muslim invaders; and into south India in 1832 by the Christian missionaries from France. Grape was well known to people even in ancient India but it was not commercially cultivated until the 14th century. 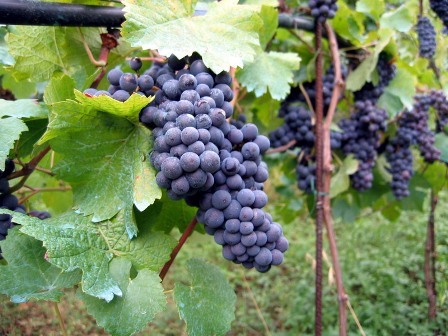 Wild grapes grown in the North West Indian state of Himachal Pradesh were used to prepare local wine. Presently grape cultivation is concentrated in the peninsular India, accounting for 90% of the total area. Major grape-growing states are Maharashtra, Karnataka, Andhra Pradesh, Tamil Nadu, and the north-western region covering Punjab, Haryana, Delhi, western Uttar Pradesh, Rajasthan and Madhya Pradesh. Temperature, humidity and light are important for grapes. Hot and dry climate is ideal. Areas with high rainfall are not suitable. The climate requirements of vinifera are different from those of labrusca grapes. Mild temperature, not exceeding 35 C in summers, impairs the fruiting of vinifera grapes, particularly, in Thompson Seedless. Higher night temperatures (above 25 C) during ripening hamper the colour development in coloured grapes. Cool nights and hot days even though congenial for coloured grapes, pink pigmentation development in green grapes if the diurnal differences are more than 20 C during ripening. Under high humid conditions, the vines put forth excessive vegetative growth at the expense of fruiting. Berries do not ripen properly. Disease incidence is high. The total amount of rainfall is not the criterion, but the timing frequency and duration of rainfall are important considerations for grape cultivation. Rains associated with cloudy weather and poor sunlight during 45-60 days after back pruning in the tropical India reduce the fruitful buds in a vine. Rainfall during flowering and berry ripening cause enormous damage to gapes. If rains coincide with flowering, the panicles are destroyed by downy mildew. Rains during ripening cause berry cracking and rotting. Grapes are grown on a variety of soils in India, alluvial in north, heavy black clay in Maharashtra and north Karnataka, red loam in southern Karnataka and Tamil Nadu and very light sandy locally called ‘Chalka’ soils in Andhra Pradesh. Soil with good drainage and water-holding capacity in a pH range of 6.5-7.5 is ideally-suited for grapes. Presence of excess salts, particularly sodium and free calcium is detrimental for grapes. Vines become weak and their productive life span is reduced. The electrical conductivity of the saturated extract of soil should be less than 4mimos/cm; its exchangeable sodium content should be less than 15%. When the soil contains more free calcium than 12%, vines suffer from iron deficiency and the soil gradually becomes sodic. High content of sodium in soil poses drainage problems and the root growth is impaired. Soil of Maharashtra, Haryana and Punjab are saline-alkali. Free calcium content is also high in soils of Maharashtra. More than 20 varieties are under cultivation. However, only a dozen are commercially grown. They can be grouped under 4 categories based on colour and seeds. Currently, Thompson Seedless is the ruling grape, occupying 55% of the area with its clones. Bangalore Blue occupies approximately 15% of the total area while Anab-e-Shahi and Dilkhush (15%), Sharad Seedless (5%), Perlette (5%) and Gulabi and Bhokri together (5%). Grape is mostly propagated by hardwood stem cuttings. Four-noded cuttings fromWell mature canes on proven vines are made. The diameter of cuttings should be 8-10mm. Cutting are mostly obtained from October pruning in the peninsula. Rooting of cuttings is not a problem. However, Thompson Seedless roots are poorer than Anab-e-Shahi or Bangalore Blue. To increase the rooting of stem cuttings, they should either be soaked or dipped to cover the basal buds in IBA solution. For overnight soaking, 500 ppm IBA solution is used, while 2000 ppm solution is used for quick dipping for 10sec. before planting the cuttings. Quick dip method is preferred. Cutting after treating with IBA should be planted in the nursery or directly in the field. Cuttings are planted in nursery either in beds or polybags for rooting. The beds or polybags should be under partial shade. The rooting media should have 30-405 well-decomposed cattle manure to retain moisture and similar proportion of sand to provide drainage. The beds or rooting medium should be treated with Chloropyriphos or Furadan granules to prevent termite damage. Light frequent watering is to be given to the cuttings. For planting in field, 3-4 cutting should be plated at each spot. Cuttings are covered with green twigs to provide shade. After rooting, one good cutting is retained at each spot. Gap filling should also be done at this stage. Rootstocks are employed for grapes to overcome salinity, nematode damage and to impart vigour to vines. In normal soils with good and adequate water for irrigation, rootstock is not necessary. In nematode-prone soils, the rootstock 1613 can be used for Anab-e-Shahi or Thompson Seedless. In saline soils, Dog ridge is better. 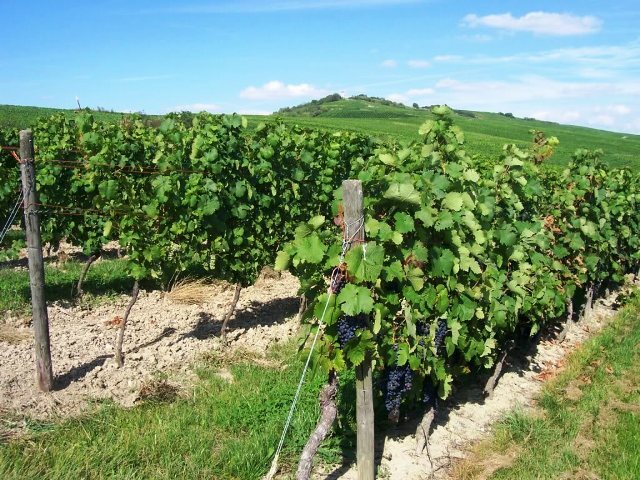 Use of Dog ridge in non-saline, nematode-free soils, particularly under mild climatic conditions makes the vines barren by imparting excess vigour. Before plating the rooted/UN rooted cuttings in the main field, the land is cleared of all bushes and leveled. Trenches or pit 1m wide and 75 cm deep are opened. When plant spacing within a row is less than 2m, continuous trenches are made. The pits/trenches are filled with farmyard manure, green manure/leaf-mould, bone-meal (1kg), super phosphate (1kg) and allowed to settle by watering. Cuttings are planted in their position by opening a small pit. A mixture of sand, well-rotten manure and super phosphate (0.5kg) is packed around the cutting in the pit. The soil around the planted cuttings is drenched with a solution of Chlorpyriphos. October is ideal time for planting the unrooted cuttings directly in the field. Rooted cuttings are planted in January-February. When rootstock plants are planted, budding or grafting is done in July-August. Either chip budding or wedge grafting is employed. Wedge grafting is better. Spacing of vines depends on the variety, vigour of vines and system of training Generally Anab-e-Shahi and Dilkhush vines are spaced at 3.3, x 6.6m or 5.0m x 5.0m. The spacing of vines of seedlings varieties varies from 1.2m to 2.0m within a row and 2.7 to 3.6m between rows when trained to ‘T’ or ‘Y’ trellis. For Thompson Seedless, the spacing of 1.8m x 3.0m is ideal for bower and ‘Y’ trellies trained vines respectively. Different systems of training-head, kniffin, telephone, V, expanded Y and gable-are in vogue in India. Productive potential of vines is better exploited on bower than on any other system of training. But this system is expensive, encourages diseases, and is not suitable for mechanization of cultural operations. On head, Kniffin and telephone systems of training not only the yields are low but the fruits are exposed to sun resulting in sun-burn, but the yield is the same. The expanded Y with long arms and gable system connecting the side arms of adjacent rows are best-suited for training seedless grapes,since these systems posses the advantages of bower and at the same time do not have disadvantages associated with it. In north India, vines are pruned in winter (December-January). Half of the canes are pruned to renew spurs and the rest for fruiting canes. One or two buds from the cordon (arm) are retained in renewed at spurs and 12 buds are retained on fruiting canes. The numbers of buds left on fruiting canes depend on variety and thickness of cane. Thick canes are pruned longer and the thin shorter. The fruited canes are pruned to renewal spurs and the canes developed from renewal spurs are pruned to fruiting canes in the next winter. In Maharashtra, Andhra Pradesh and north Karnataka, vines are pruned twice (April and October). The April pruning is generally termed as back pruning or foundation pruning. While October pruning is called fruit pruning or forward pruning. All the canes are pruned to spurs at back pruning, irrespective of the variety or cane thickness. The number of buds retained on a cane at forward pruning depends on variety and cane thickness. The nutrient status of vines is far in excess than required leading to certain nutrient imbalances, particularly Mg deficiency as a result of heavy doses of K.
Grape requires more K than N which in turn is required more than P. However, P is required at the time of fruit-bud formation when N requirements are less. The N is required more for shoot growth during the fruiting season. Whereas K is required after bud differentiation for shoot maturity and increasing the size of fruit-bud. It is also required after berry set until ripening. The annual schedule for manuring grape plants is given in Table 1. More P and less K are required in Maharashtra and north Karnataka for Thompson Seedless grape, as the soils of this region are rich in k and fix more P. the doses are adjusted by regularly monitoring the petiole nutrient contents. Petioles of leaves at fifth node from base are sample on 45th day after black pruning, while those of leaves opposite to flower clusters at full bloom are sampled after October pruning in south India. It is better to sample on 45th day after back pruning. However in north India, sampling is done only at full bloom. The optimum petiole nutrient contents on percentage dry weight basis are given in Table2. Nutrient application in the subsequent years should be based on these petiole nutrient standards. Heavy dose of cattle manure is applied to improve soil structure and to increase its moisture-holding capacity. About 25-50 tonnes of well-decomposed cattle manure, 5 tonnes of oil cake (deoiled) and 1,200 kg of organic mixture should be applied every in a hectare crop. When such organic nutrients are applied, the inorganic doses are proportionately reduced. Among the nutrient deficiencies, Mg deficiency is universal. About 100-200 kg of magnesium sulphate/ha/year should be applied depending upon the severity of its deficiency. While 50 kg is applied after 30 days of April pruning, the rest is applied in 2 splits during the fruiting season once at berry set and again after a month. Magnesium is t b applied to soil at least one week prior to potash application to increase its uptake. Iron deficiency is very common in black soils. Foliar application of 0.2% ferrous sulphate solution or chlelated iron compound is recommended. Although all soils in India are deficient in Zn, its deficiency in the plant is not observed. Grape is a shallow feeder. Light and frequent watering is better for grapes. Water requirement of grape are very high during berry growth. This period coinciding with hot and dry weather, more water is required at this stage. Least water is required during fruit-bud formation. This period if coincides with cloudy weather and rains, watering are totally to be stopped. Reduced irrigation during ripening, i.e. (one month prior to harvesting) improve the quality of grapes and hastens ripening. Too much stress during ripening can also increase the berry drop at and after harvesting. Currently due to the shortage of water, grapes are irrigated through drips. The number of drippers/vine and their placement are very crucial in drip irrigation. The active feeder root zone is to be wetted by the water discharged through the emitters. Since the wetted pattern is more horizontal than vertical in clay soils but more vertical than horizontal in sandy soils, more emitters with low discharge rate for longer duration are advisable to get good results with drip irrigation in sandy soils. Inadequate wetting of root zone reduces shoot vigour and weakens the vines. Gradually they develop deadwood and go barren 7-8 years after planting. The quantity of water to let through drip irrigation daily depends not only on the stage of growth of the vine but also the evapotranspiration in a vineyard. Putting these two factors together the water requirement of grapes through drips is given in Table3. Grape is sensitive to chlorides and total salts content in irrigation water. Water with electrical conductivity of less than 1mmhos/cm, chlorides less than 4m.e/litre, sodium adsorption ratio less than 8.0, residual sodium carbonate less than 1.25 m.e/litre and boron less than 1.0 mg/kg is considered safe for irrigation grapes. Raising a bund of loose soil to a height of 1’ along the vine rows and mulching the soil around the drip zone by sugarcane trash or paddy straw can conserve the soil moisture and save irrigation water. Farmyard manure and compost are the major sources of weed seeds from outside. The problematic weeds in vineyards are Bermuda grass (Cynodon dactylon) and nut grass (Cyperus rotundus). The weed intensity is less in bower trained vineyards. Mechanical control is most common means of weed control in India. Dhaincha and sun hemp are grown as intercrops to check the weeds in vineyards trained to T, V or Y trellises. Post-emergent weedicides-Paraquat (7.5 kg/ha) or Glyphosate (2.0 kg/ha), is also recommended. Glyphosate offers a long time control of weeds as compared to Paraquat. Growth regulators- CCC, GA and hydrogen cyanamide-are being used commercially in grapes. The CCC is used t suppress the vigour of vines and increase the fruitfulness of buds. It is sprayed at 500 ppm concentration at 5-leaf stage after back pruning. If weather is cloudy, cool and rainy, it is sprayed on the foliage once again at 10-leaf stage. Gibberallic acid (GA) is used invariably in all seedless varieties. It is sprayed at 10 ppm to elongate the clusters, 22-25 days after forward pruning (4-5_leaf stag). It is also sprayed on clusters @ 40 ppm at 50% bloom stage for thinning the berries. For increasing the berry size, the clusters are dipped in 60ppm GA alone or in a mixture of GA (30 ppm) it 10 ppm BA 2 ppm CPPU at pearl millet or bajra grain-size berries and again at red gram sexed berries. Care must be taken not to treat the Custers with GA before bajra grain-sized berries. Otherwise, berries of uneven size form a cluster. For increasing berry size, vines are girdled. Girdling is a process of removing 2-3 mm wide strip of bark around the stem without injuring the wood. This is also to be dot at the bajra grain-sized berries. Hydrogen cyanamide is used to hasten and increase the bud-break at winter pruning. Buds are swabbed with cotton soaked in 1.5% solution of hydrogen an amide 48 hr after pruning/ Hastening the bud-break with hydrogen cyamide also hastens the ripening of grapes in the north. Thiourea (4.0%) mixed with 1% Bordeaux mixture is also used to increase bud-break in south. Grapes are harvested when fully ripe, since they do not ripen after harvesting. In seeded grapes, the seeds become dark brown when they are fully ripe, while in seedless varieties, their characteristic berry colour develops fully. The yield potential of grape in India is highest in the world. Grape variety Anab-e-Shahi has recorded yield as high as 92 tonnes/ha, whereas Thompson Seedless has 48 tonnes/ha. The average yield o Anab-e-Shahi and Bangalore Blue is 40-50 tonnes/ha, while that of seedless varieties is 20 tonnes/ha. Grapes should be harvested during cool time of the day. Harvested grapes are trimmed, graded and packed. For local market, grapes are packed in bamboo strip baskets using newspaper and grape leaves as cushioning material. One basket contains 6kg of grapes. For distant markets (within the country), wood or corrugated cardboard boxes are used for packing. Old newspapers, hay and paper shreds are used as cushioning material. The size if packing is 6 or 8kg in wood boxes, and 2 or 4kg in cardboard boxes. Transport of grapes is mainly by trucks. Grapes are exported to middle-east, Europe and south Asian countries. Grapes are packed in ventilated cardboard boxes using dual release sulphur dioxide releasing pads (grape guard) as an in packing material to check the postharvest diseases during transit and storage. Strict cold chain is maintained right from harvesting by precooling and cold storage. Boxes are stored at o -1 C temperature and 90%-95% relative humidity in cold storage. They are transported by sea in refrigerated containers. Most of the grapes produced in India, irrespective by variety, are consumed fresh. Negligible quantities of Bangalore Blue are crushed to make juice and wine for household consumption. Wine is also produced in India with French collaboration by some private industries growing certain French varieties. Raisins are the only processed products in India. Approximately 30% of seedless grapes are dried to produce 15,000 tonnes of raisin. Golden bleached raisins are produced by shade drying the clusters after dipping in either boiling solution of sodium hydroxide (0.2-0.3%) and exposing to sulphur fumes. Dipping in soda oil (dipping oil) containing ethyl oleate and potassium carbonate and shade drying is the most common method of preparing raisins in India. Seeded grapes of Anab-e-Shahi are also dried in very small quantities to make raisins. Of physiological disorders, uneven ripening, post-harvest berry drop, flower-bud and flower drop and pink berry formation are major ones. Presence of green berries in a ripe bunch of coloured grapes is called uneven ripening. It is varietal character and a problem in Bangalore Blue, Bangalore Purple, Beauty Seedless and Gulabi grapes. Within a variety this problem varies from bunch-to-bunch. Generally inadequate leaf area and non-availability of reserves to a developing bunch is the reason. Cultural practices like cluster thinning, girdling and use of growth regulators can reduce uneven ripening. Application of Ethephon (250 ppm) at colourbreak stage is recommended to reduce the problem. This is due to weak pedicel attachment to the berries. This is common in Anab-e-Shahi, Cheema Sahebi and Beauty Seedless. Spraying of NAA (50 ppm), a week prior to harvesting can minimize the post-harvest berry drop. When panicles are fully expanded, the flower-buds drop before the fruit set. This is common in north India but not in the south. The reasons for this disorder are not known. Stem girdling about 10 days prior to full bloom can reduce and problem. It is a common disorder in Thompson Seedless and its clone Tas-A-Ganesh in Maharashtra. Pink blush develops on a few ripe berries close to harvesting. The pink colour turns to dull red colour and the berries become soft and watery. They do not stand for long after harvesting. Although the definite cause of the disorder is not known, it is recommended to spray a mixture of 0.2% ascorbic acid and 0.25% sodium diethyl dithiocarbamate at fortnightly intervals commencing berry softening.